Bedell is a long time Freeport area family name that dates back to some of the original settlers of the village and its surrounding area on the south shore of Long Island. The Atlantic Dairy apparently had it’s roots in the Long Island farm of Charles Bedell and the Bedell Brothers named on the bottle were likely two of his three sons, Treadwell and Archer (sometimes referred to as Archie). According to his obituary in the November 27, 1908 issue of the Nassau County Review, Charles Bedell was a lifetime resident and farmer on the south shore of Long Island. He was born in the neighboring village of Baldwin and moved to Freeport in the late 1880’s. The funeral services of Charles Bedell, an old and well respected resident of this place, were held Monday afternoon at his late home, where he died on Saturday from paralysis. He resided in Freeport twenty years, was a farmer by occupation, was born at Baldwin and lived at that place and Freeport all his life. He was eighty years of age. Deceased was survived by five children: Henry Bedell, of Merrick; Mrs. Thomas Baldwin, of Baldwin, Catherine, Treadwell and Archie Bedell, of this place. As best I can tell, the Freeport farm, where he spent the last 20 years of his life was located along what is now Atlantic Avenue between Bayview Avenue to the east and Milburn Creek to the west. Charles’s three sons, Henry, Treadwell, and Archer all worked on the farm at one time or another. The 1900 census records and the 1901-1902 Freeport directory listed the oldest, Henry, with the occupation milkman living on Bayview Avenue. The 1900 census listed both Treadwell and Archer as farm laborers, also living on Bayview Avenue. There’s no mention of Bedell Brothers or Atlantic Dairy in the 1901-1902 directory. According to an article in the December 18, 1908 issue of the Long Island Farmer, when Charles died on November 21, 1908, his two younger sons, Treadwell and Archer, were allowed use of the estate, which I assume included the farm, for the next five years. The will of Charles Henry Bedell, of Freeport, leaving an estate of $38,000 was offered for probate on Tuesday. Treadwell and Archer Bedell, sons, were given the use of the estate for five years. At the expiration of that time the estate is to be divided equally among five children. The 1910 census records confirmed the above story. Both lived at the same location on Atlantic Avenue and both listed their occupation as milk dealers. Around this time, Bedell Brothers also appeared in the limited directory information I can find. 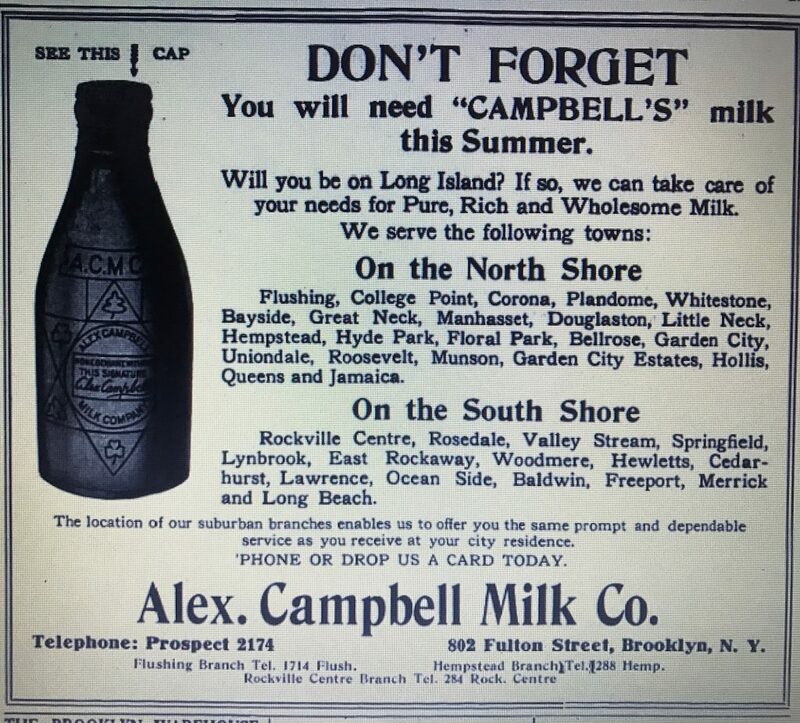 The Freeport section of the 1913 Montauk Business Directory of Long Island listed Bedell Brothers as milk dealers located on Atlantic Avenue and the 1914-1915 Freeport Directory listed both Treadwell and Archie Bedell individually as dairymen. Their address was given as Atlantic Avenue near (Millburn) creek. By 1910, Henry had moved to Merrick and did not list milk or dairy as an occupation in the census records. So it looks like the dairy farm was in operation beginning in the 1880’s and that sons, Treadwell and Archer became more involved in the early 1900’s, as Charles got older. It makes sense that the name Bedell Brothers started around this time. The dairy probably lasted into the early 1920’s. Treadwell is still listed at the Atlantic Avenue location in 1920 census records along with Henry’s son, Edgar. Treadwell listed his occupation as a truck farmer while Edgar listed his as a milkman. By 1930 I can’t find any Bedell’s on Atlantic Avenue in Freeport. The bottle I found is a machine-made quart. It exhibits some sun-purple coloring indicating the presence of manganese dioxide which was predominantly used as a decolorizing agent prior to 1920. This supports a manufacture date right around the mid-teens when Treadwell and Archer were both located on Atlantic Avenue following their father’s death. I can only find two references for Schwartz’s Dairy at the Woodhaven Queens location. Schwartz’s Dairy, Inc., of Queens was chartered today with $10,000. capital, to deal in milk, butter, cream and cheese. David C. and Rose Schwartz of Union Course and Bessie Greenbaum of Manhattan are directors. A similar incorporation notice in another publication listed the Schwartz’s address as 240 Drew Avenue (now 75th Street) in Woodhaven. In 1920, census records indicate that David C. and Rose lived on a dairy farm located on Juniper Swamp Road in Middle Village Queens and later, in 1930 and 1940 on a farm on Caldwell Avenue, also in Middle Village. Both farms were run by members of the Schwartz family. Based on this I assume that they were bottling and selling/delivering milk for one or both of these farms as early as 1915. The Schwartz Dairy, Inc. was apparently the predecessor of the Elmhurst Dairy that was started in 1919 by two members of the Schwartz family, Max and Arthur Schwartz. Elmhurst Dairy is listed as early as the 1922 Copartnership and Corporation Directory for Brooklyn and Queens and remained in business through 2016. The bottle I found is a machine-made quart. It’s heavily sun-purpled indicating the presence of manganese dioxide which was predominantly used as a decolorizing agent prior to 1920.This supports a manufacture date right around the time of incorporation in the 1915-1920 range. Samuel E Johnson was a long time Freeport resident who operated a small milk business out of his home address from the late 1910’s to the late 1920’s. 1920 census records state his occupation was a milkman who owned his own store and he’s listed as milk in the 1923 and 1926 Freeport directories. In the early 1920’s he apparently had a partner in the business. The 1923 Directory listed the business as Johnson & Co (Samuel E Johnson, Charles Sealey) milk, 180 Bedell. The 1926 Directory simply listed it as Samuel E Johnson, milk, 180 Bedell. The 1914 Freeport Directory and 1930 census records indicate that before and after he ran the business, Johnson was an employee of the Brooklyn Water Works. As expected, 180 Bedell Street is a single family residence, portions of which look like they date to the 1920’s. A widened driveway runs around the back that could have accommodated milk wagons. The bottle I found is a machine made quart that fits with the 1920’s period of the business. Muller Dairies has it’s origins with John Herman Muller who, according to his obituary in the April 3, 1928 issue of the Brooklyn Daily Eagle, was a well known dairyman. He was born in Germany in 1874 and lived in the United States for 40 years. According to census records, in 1900 he was a clerk in his father’s grocery store where he remained through at least 1905. In the 1909 NYC Directory he’s listed as milk at 557 West 42nd Street and the 1910 census lists him as a milkman with his own milk wagon. Around 1916 he moved to 513 West 55th Street and by the mid 1920’s the business was located at 617-619 West 46th Street. It’s not clear what happens immediately after his death but by March 1930 the business was called Muller Dairies Inc., and was a subsidiary of the National Dairy Products Corporation. In 1933, the NYC Directory listed Muller Dairies, Inc. as a NY corporation with William Jordan as president and Edward N Miller as vice president. They were still located at the West 46th Street address. Sometime before 1940 the business moved to 470 West 128th Street and was still listed there in 1948. In the mid-1930’s Muller was caught in a scheme to purchase its fluid milk requirements lower than the prices fixed by the New York State Division of Milk Control. The scheme shifted plants from one subsidiary to another within the National Dairy Corporation and resulted in Muller receiving milk classified as surplus, instead of fluid, which enabled them to pay a lower price. This, according to various newspaper accounts, cost the milk producers over $17,000. during April 1935, or at the rate of over $200,000. per year. 470 West 128th Street was originally part of the Yuengling Brewery complex that had frontages on Amsterdam Avenue as well as West 126th, 127th and 128th Streets. During National Prohibition, the buildings within the complex were adapted for other uses, including a dairy (Clover Farms was located at 470 West 128th Street in the mid – 1920’s). Horton’s Brewing Company returned the Youngling complex back to a brewery once Prohibition ended but 470 West 128th was one of two buildings that continued as non-brewery. Today it looks like the building has just recently been demolished. The bottle I found is a machine made quart with the 470 West 128th Street address embossed on it. This dates it to the mid to late 1930’s at the earliest. Clover Farms was built up by the efforts of two men, Luther Campbell and John Weisenfluh. According to 1880 census records both men were raised in the dairy farm country of Sullivan County New York and apparently Campbell married Weisenfluh’s sister. The business started on Broadway in New York City in the 1890’s and was ultimately sold in 1924. Through that period, Campbell served as it’s only president and Weisenfluh as a director, either secretary, treasurer or sometimes both. Clover Farms, Inc had it’s origin in November, 1891 as L.L. Campbell & Bro., starting in business with one lone milk wagon, the driver of which was L L Campbell. The first day’s deliveries consisted of 68 quarts. The company now has 160 delivery routes. It was incorporated four or five years later as the Clover Farms Company. The name was changed to Clover Farms, Inc in 1913. Luther L Campbell is first listed with the heading milk in the 1891 Directory. 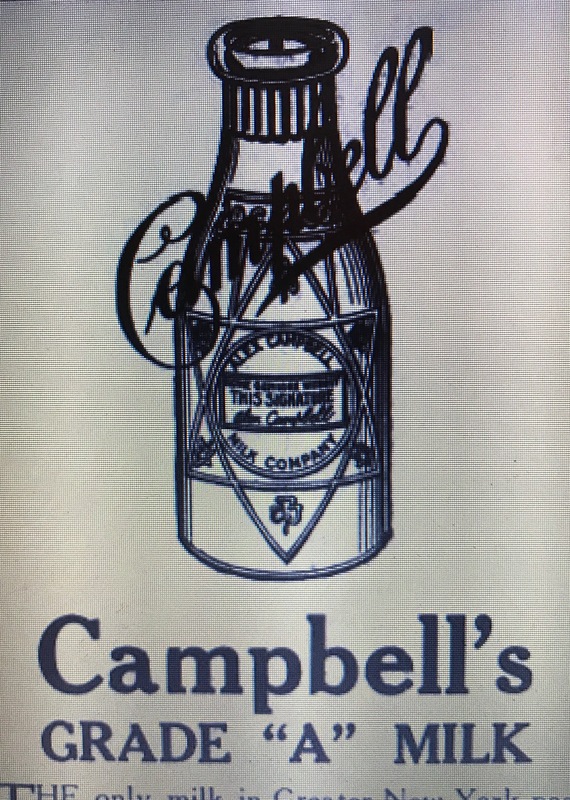 LL Campbell & Brother is first listed in 1895 or 1896. Clover Farms Co. (NY), Capital $51,000. is first listed in 1902. Clover Farms Co., Inc is first listed around 1915 with the main office located at 534 West 48th Street. In 1915, 15 branch offices were also listed. 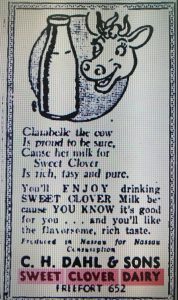 In 1913, Clover took over the Dairy Demonstration Company. The Dairy Demonstration Company was organized in 1908 by a number of prominent New Yorkers interested in infant welfare work. A plant was built at Homer (NY) and after much educational work among the farmers, the company began to supply milk to infant feeding stations which had been established by the New York Milk committee. These stations were taken over later by the New York City Department of Health. Since 1913, Clover Farms, Inc. has continued this service to the City without a break, making the name of its Homer milk famous…The Homer plant was described by Dr. Royal S Copeland, when he was Commissioner of Health in New York City, as one of the finest in the United States in point of sanitation and low bacterial count. In 1920, Clover listed it’s main office at 533 w 47th Street (it was back to back with the 48th Street address so probably one and the same facility) as well as 8 branch locations: 228 and 286 Broadway, 311 and 533 Columbus Ave, 622 W 130th Street, 435 Amsterdam Ave, 431 E 164th Street and 1010 Lexington Avenue. The sale of the company took place in December 0f 1924. Clover Farms milk stations and city distributing plants have been sold to the Dairyman’s League and the formal transfer will take place Tuesday morning December 16…The Dairyman’s League will retain the country properties of Clover Farms, consisting of seven modern milk receiving stations in New York, four of which are Grade A plants. The large distributing plant at 470 West 128th Street, New York City, will be sold to the Borden Company. Clover Farms, Inc. continued to be listed in the telephone directories through at least 1931 but was not listed in 1948. I don’t have access to the directories in 1932 through 1947 so I’m not sure when they dropped the name. The bottle I found is a machine made pint embossed Clover Farms Company. This puts it in the 1902 to 1915 time frame. 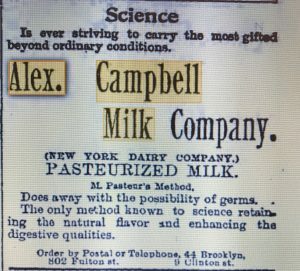 Alexander H., Alexander and Alexander C., appear to be three generations of Campbell’s all associated with the milk business in Brooklyn NY. Alexander H was first listed in the 1863 Brooklyn City Directory and remained listed through the late 1870’s as milk. He remained listed in the directory through the 1880’s but no longer as milk. 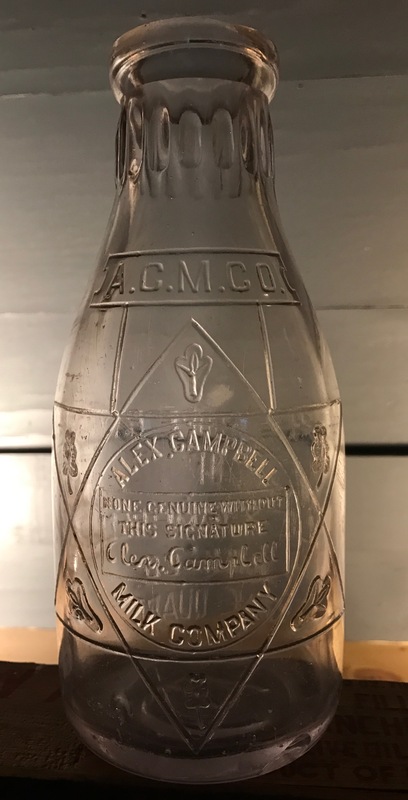 Alexander was first listed as “milk” in 1876 and sometime between 1890 and 1897 the Alex Campbell Milk Company was listed for the first time. (I don’t have access to 1890 to 1896) with Alexander named as president. Alexander C was first listed in the early 1900’s. The 1913-1914 Copartnership and Corporation Directory continued to name Alexander as President and named Alexander C as Secretary and Treasurer. This Directory also named William F Campbell as a Vice President. William’s occupation was a physician and he was probably not directly involved in the day to day operation of the company. 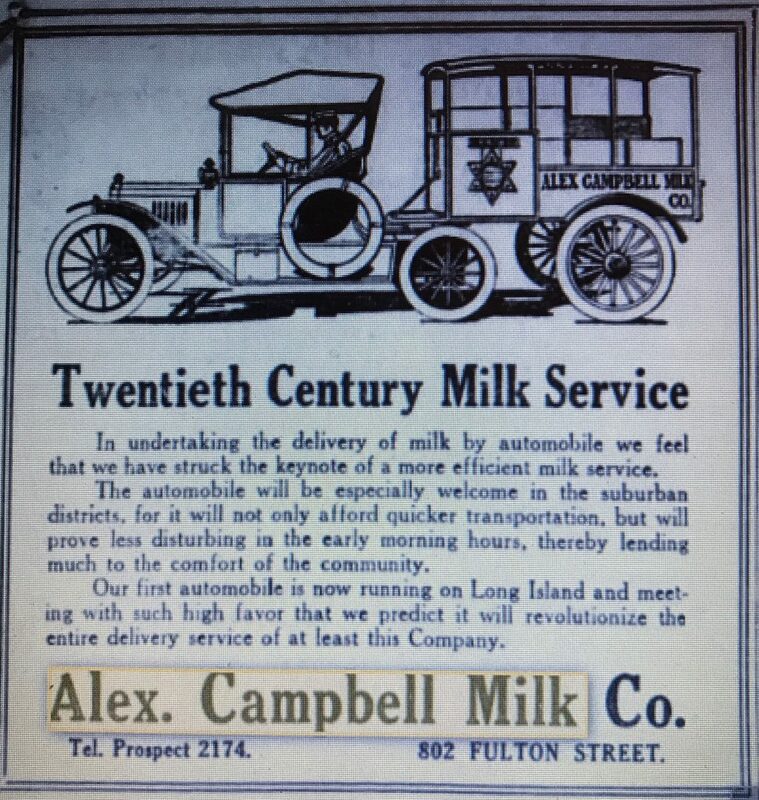 Through the late teens, the main office of the Alex Campbell Milk Company was 802 Fulton Street and by 1917 they were operating branches in Brooklyn at East New York (14 Williams), Flatbush (811 Flatbush), Flushing (Linden & Myrtle), Coney Island (220 West Ave) and Richmond Hill (N Village). Around this time they were also extensively serving Long Island. A June 6, 1914 advertisement in the Brooklyn Daily Eagle defined the extent of their reach on both the north and south shores. An advertisement in October of 1915 described how the automobile made this extensive service possible. Like most milk companies of the day, they also maintained plants/bottling stations in rural areas. During the mid-teens, a partial list of locations included; Grand Summit, Kirkwood, Monroe and Oxford, all in upstate New York.The company also maintained similar facilities in New Jersey. It appears that by 1920 the success of the business had begun to turn. Only two of the six Brooklyn locations (Flatbush and Flushing) were listed in the 1920 telephone directory and in 1924-1925 only Flatbush was listed. There were no listings for them by 1927. While they were in business, the company was apparently innovative, kept abreast of current trends and was quick to incorporate new ideas and technology into the business. They were also not shy about informing the public of this through advertising. The first milk pasteurization equipment installed in the United States was by Sheffield Farms in 1891. Campbell must have been right behind them because by September of 1894 they were advertising pasteurized milk. New York did not require it until 1914. 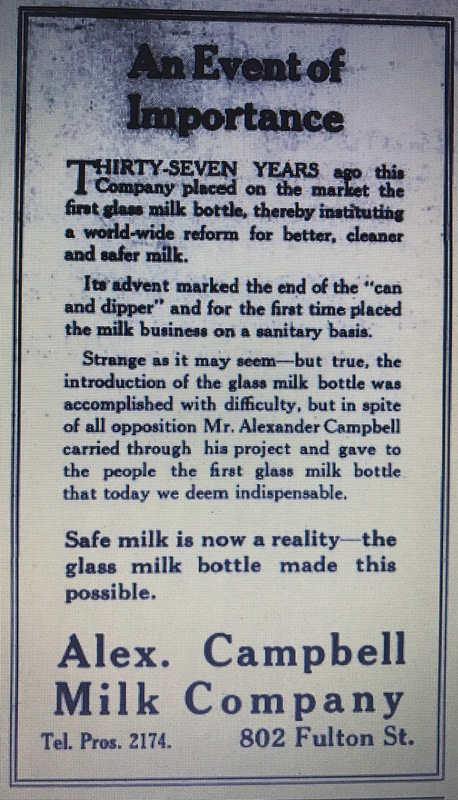 They also claimed to be the first company to use glass milk bottles in lieu of the can and dipper method. This 1915 advertisement implies that they accomplished this 37 years prior, circa 1878. The industry standard, Dr Henry Thatcher’s “Common Sense Milk Jar” wasn’t patented until 1884 and wasn’t in general use for a few years after that, so Campbell was either ahead of the curve or stretching the truth in his advertisements. There’s no sign of 802 Fulton Street today. The Brooklyn Tech High School athletic field now occupies the site. The bottle I found is a machine made quart and probably from the mid-teens. It exactly matches the bottle in a March 1915 Campbell advertisement. 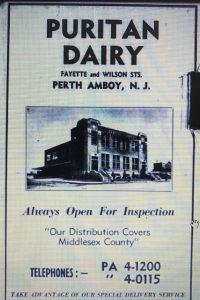 Puritan Dairy, Inc. is first listed in the 1923 Perth Amboy directory at 315-317 High Street but apparently started in business the year prior. This is based on their trademark application which states: “The trademark has been continuously used and applied to said goods in applicants business since December 20, 1922. The business remained at the High Street address through the early 1930’s and by 1935 has moved to Fayette Street, corner of Wilson. Their advertisement in the 1940 Directory actually contains a photograph of their building and their advertisement in 1942 gives a listing of their products. The company remained in business at this location through at least the early 1960’s and probably longer. Until the late 1950’s Phillip Borac served as president and Hyman Weeden served as treasurer and sometimes secretary. 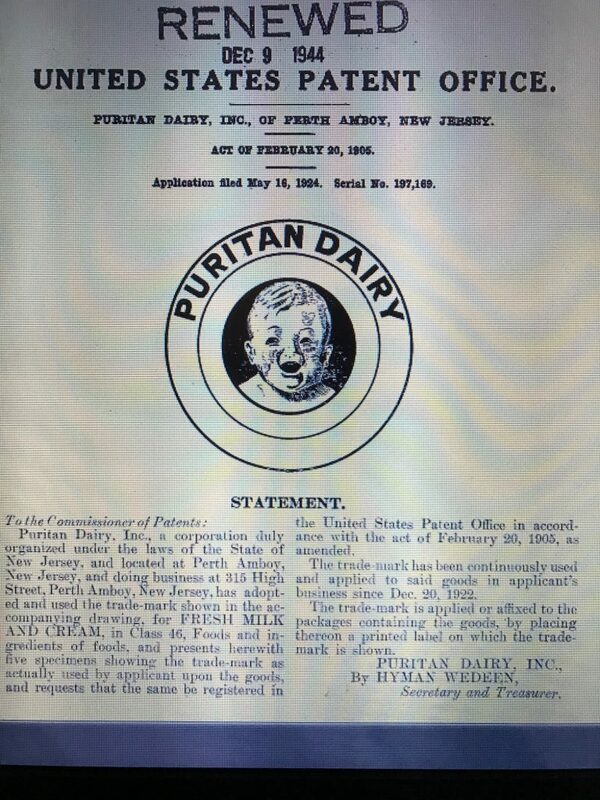 In the 1930’s and early 1940’s, a second company called Puritan Dairy Products Co is also listed in the directories. In some years both companies are listed in the same directory and other years only one. In any case, the president of Puritan Dairy Products Company was always either Borac or Weeden and the address was given as Fayette, SE corner Kirkland Place which happens to be right across the street from the Dairy. So it’s probably safe to assume that from a practical standpoint the two businesses were one and the same. It wasn’t until the late 1950’s that the company leadership transitioned to others. In 1959, Hyman Greenhouse, Louis Garb and Harold Stoller are listed as president, vice-president and secretary-treasurer respectively. 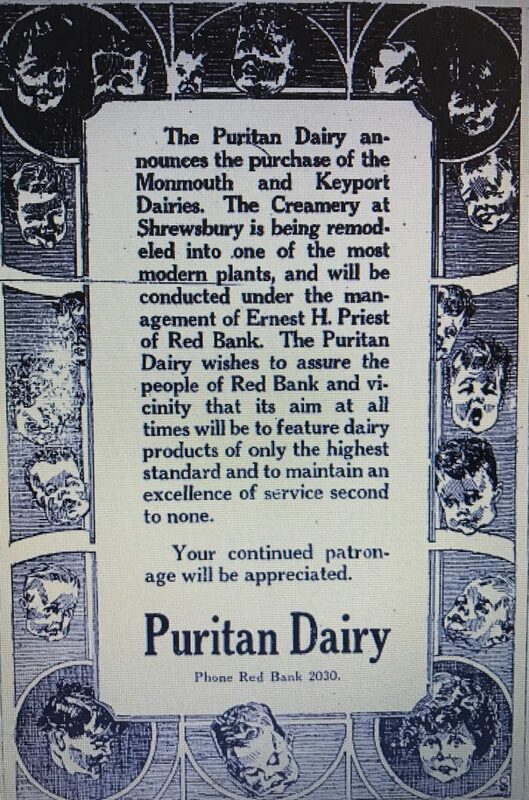 Puritan maintained creameries and bottling stations in several of the surrounding local Communities as well. According to a May 2, 1928 notice in the Red Bank Register, they owned facilities in Keyport, Monmouth and Shrewsbury New Jersey. Today, the original dairy building shown in the advertisement above is now incorporated into the plant of the Tropical Cheese Company. 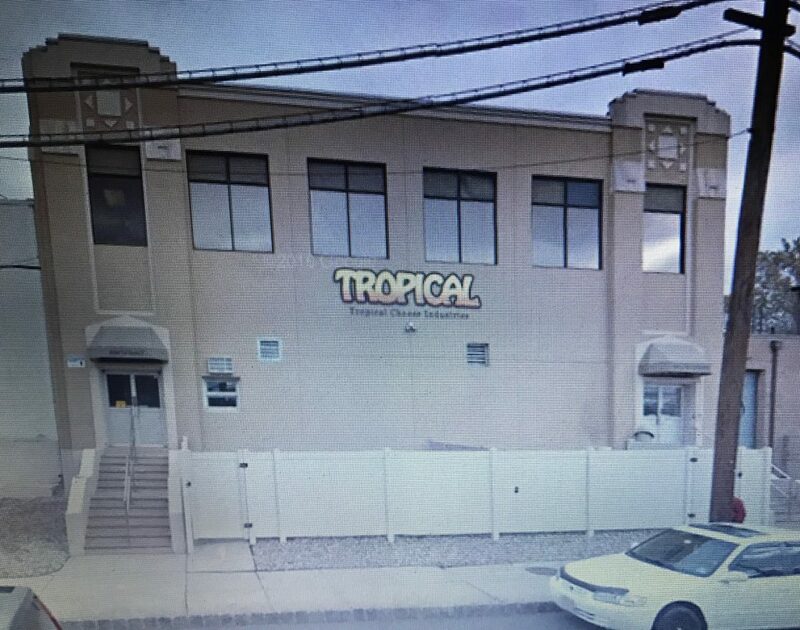 Their web site mentions that the owner of Tropical Cheese originally bought a milk company in Perth Amboy. 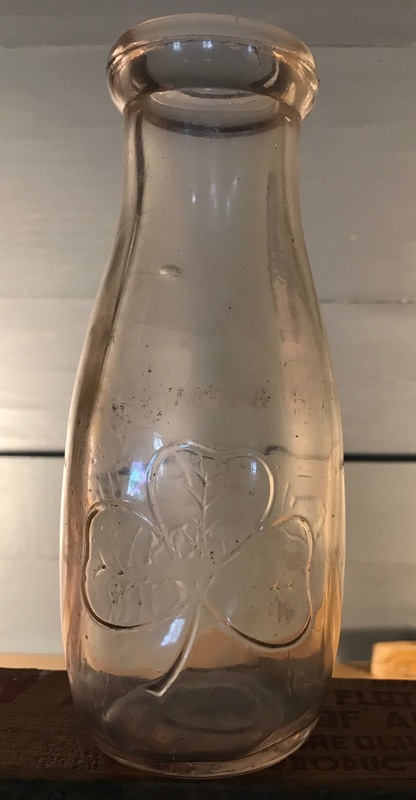 The bottle I found is a machine made quart made by the Illinois Glass Company. The date code indicates 1934 so it was made right around the time they moved from High Street to Fayette Street. 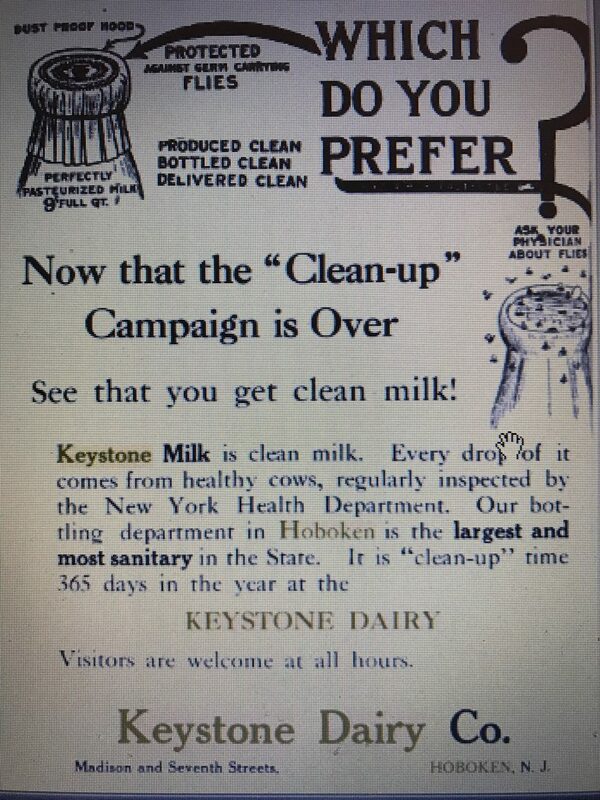 The Keystone Dairy Company, originally located at 211-215 Bloomfield Street in Hoboken, was also known as the Keystone Dairy and Ice Cream Company. 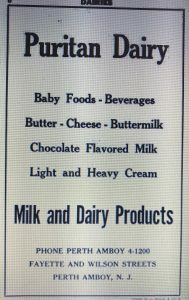 It was in business from the late 1800’s to 1925 when it was purchased by the Consumers Dairy Co. Later, in 1928, as part of Consumers Dairy, it became a subsidiary of the National Dairy Products Corporation but continued to operate under the Keystone name. It’s not clear to me when the name was discontinued but apparently it lasted several decades. The early history of the business is told in a special edition of Hoboken Illustrated, dated January, 1909 that I found on the Hoboken Historical Museum web site. The business was founded in 1890, by Mr. F. Kroog and was made a corporation in 1906 with the following gentlemen as officers. F Kroog, president; F Kroog, Jr., vice-president; Wm M Kroog, treasurer; Chas Kroog, secretary; and under their skillful management a success has been achieved, a large patronage has been developed, and the trade now extends to all parts of Hoboken and vicinity. 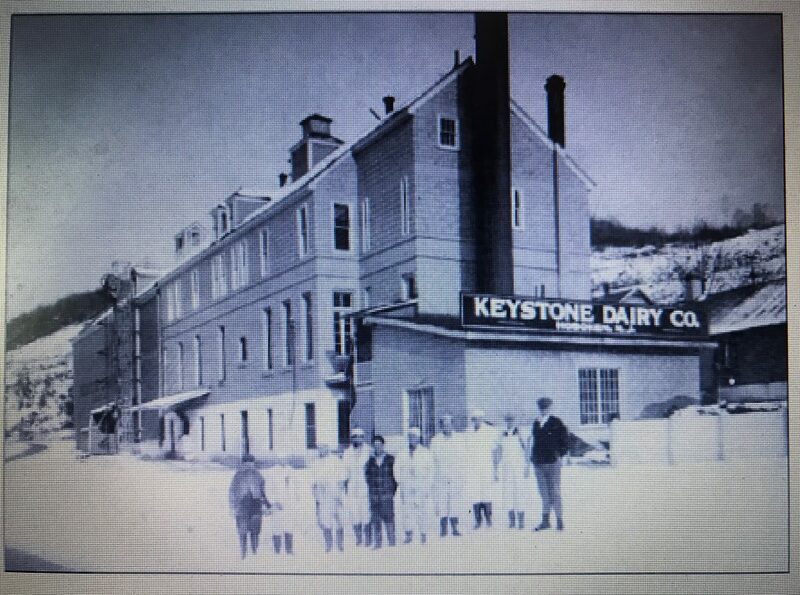 The Keystone Dairy Company receive their supplies direct from their own creameries and bottling stations which are located at New Milford Pa., Treble, N.Y., Vestal, N.Y., Tobacco, N.J., Chester, N.J., all of which is handled by the most modern methods. Pasteurized milk, cream and condensed milk a specialty. They have every facility for the expeditious prosecution of business and are prepared to supply hotels, restaurants and families with prompt daily regularity on the most favorable terms. The company have in course of construction at Seventh and Madison Streets , one of the most modern and up-to-date plants in the world, the cost of which will be about $50,000. It will cover a plot 100 x 100 feet, will be two stories high and built of concrete, brick and steel…They now supply over 5,000 families in Hudson County and when the new plant is ready for business (Which will be about December 1st) they will be able to easily double the output. 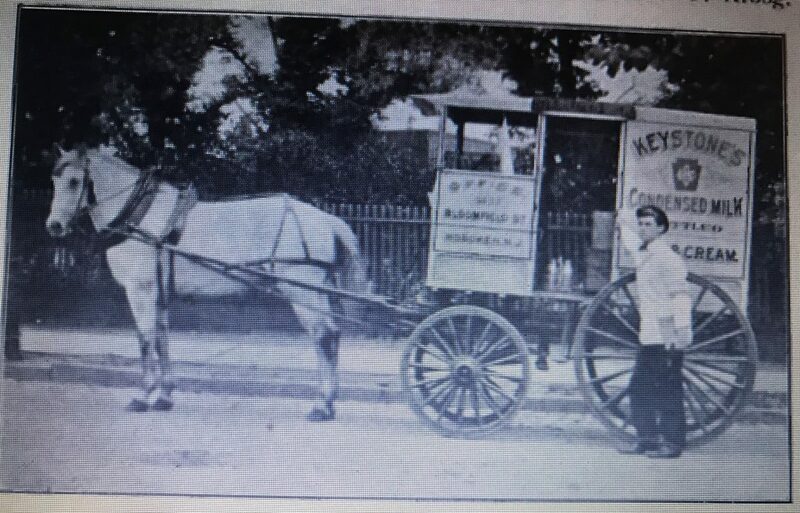 The story also contains a great picture of a Keystone Dairy milk wagon from that era. I’ve not been able to confirm the company start date of 1890 with the local directories of Jersey City/Hoboken. The first listing for Keystone Dairy Company that I can find is in the 1899 directory. The year before, in 1898, Frederick Kroop is listed as a grocer. The company maintained a number of local brach offices in both Jersey City and Hoboken as well as facilities in rural areas of New York, New Jersey and Pennsylvania. In addition to those listed in the above story, they maintained one, The Hop Bottom Creamery, in Hop Bottom Pennsylvania. According to various Pennsylvania Department of Agriculture documents it was owned by Brooklyn’s High Ground Dairy from at least 1907 to 1913 and by the 1920’s it had changed hands to Keystone. This is verified by a Susquehanna Historical Society photograph. According to the Susquehanna Historical Society the Creamery building still exists today. the Madison Street headquarters in Hoboken is now a Catholic School. The bottle I found is a machine made quart. It probably dates to around the mid to late 1920’s, right around the time the business was transitioning ownership from the Kroog’s to Consumers Dairy to National Dairy Products. Willow Dairy, George Hendrickson, Prop. Grade A Milk and Cream. Seaman’s Neck Road. Phone 1048. This is confirmed in the 1940 census records where George Hendrickson was listed as the owner of a dairy farm on Seaman’s Neck Road. Living with him were his son Lloyd, who was listed as a dairy farm bottler, four dairy farm hands and a cook. Based on this, I assume that the business was small and local to the Wantagh/ Seaford area of Long Island. Prior to that, in the 1920’s and early 1930’s, he was located in Oceanside Long Island. The 1920 census listed him as a milk inspector and in the 1926-1927 Rockville Centre City Directory, including Oceanside and East Rockaway, he was listed as the proprietor of a dairy at 88 Anchor Avenue. He was still listed as a the proprietor of a dairy farm in Oceanside in the 1930 census records but was not listed in the 1937 edition of the Rockville Centre Directory. So sometime between 1930 and 1937 he moved to Wantagh/Seaford and either took over or started the Willow Dairy. The public will be given an opportunity to learn by first-hand observation the intricacies of running a dairy farm through a dairy tour to be held in Nassau and Suffolk on Oct. 28…the inspection trip also will give dairymen a chance to study the operation of other farms. Starting at the farm of George Hendrickson, Wantagh, the tour will inspect John Randall’s farm, Mount Sinai, where lunch also will be served, proceed to the Pierson farm at East Moriches and end at the Gould Dairy in East Hampton. It’s not clear when the business ended but the bottle I found is embossed “duraglas” with a 1949 date code embossed on the base. So they were at least in business from the mid 1930’s to the late 1940’s. It was probably gone by 1958 when the original Seaman’s Neck Road was acquired to facilitate construction of the Seaford Oyster Bay Expressway. The bottle I found is a machine made quart with the 1949 date code.